Back in August, I decided that I'd do a few posts on classic novels that have movie adaptations. 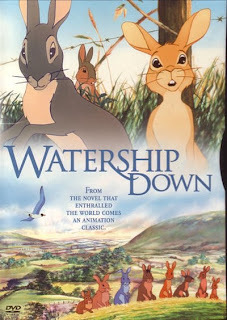 Given that I subscribe to one of these services that sends me movies fairly randomly, I haven't received a movie based on a book since this time, but I finally received one in November - Watership Down. This is the first book club book I read, more than three years ago now. I remember not really enjoying it at the time, but I have to admit that Shannon's comment about the book being memorable is apt. I still remember some of the made up words like 'silflay' and 'hrudu'. First off, let me say that I was impressed by how much the plot of the movie followed that of the novel. For an animated movie from before I was born, I am surprised at how much death permeates the movie. This is true to the book, but it is fairly graphically displayed and I wasn't really prepared for it. The movie starts out simply enough with the talk of the great Firth and how rabbits were created and then overpopulated. When the great Firth told El-ahrairah to take care of the problem so he didn't have to do something about it, he was ignored and so Firth made a bunch of predators for the rabbits and had to give the rabbits traits like 'strong hind legs' so they could survive by outrunning threats. After this little opening, the animation changed to what you see in the picture to the left. I loved the way Fiver was portrayed, and his character was the glue that held together the story. 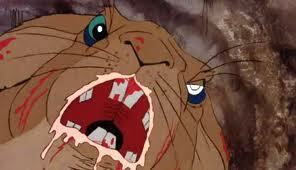 Hazel was there in all his glory, and so is Bigwig, Woundwort and the Black Rabbit. The Black Rabbit (death) was portrayed in an interesting manner, which I really enjoyed as well. I found the movie didn't hold my attention very strongly, but it was a movie I will probably never forget. I would recommend watching it for those who enjoyed the book, but be prepared that the animation may be nothing like what you've seen before. Watership Down was one of my favorite books when I was a kid, and I read it again with my kids and loved it all over again. But I watched only a part of the movie years ago and stopped. A colleague of mine reminded me why. When I told him I was reading the book with my daughter, he said, "Just don't get the movie. It's a bunny blood bath." Heres an irony for you though, a couple of years ago the guy who composed the song Bright Eyes hired some people to shoot rabbits on his land as they was getting over populated! I was one of those weird kids (I guess) who loved dark movies! This and The Dark Crystal were two of my favourite movies when I was very young (like, four or five) and stuck with me. It's funny, because I don't consider this to be a children's book or a children's movie. You'd have to know your own kids to know whether they'd like it. I actually still have a jigsaw puzzle based on the movie - it has eight square screen shots from the film, all surrounded by briars and brambles and blackberries. One of the scenes is of Fiver watching the field run with blood (his vision). Another is of the bird pecking shot out of one of the rabbit's flanks. I think the movie is like a family member to me. When I finally got around to reading the book a few years ago, I too noticed and liked how similar the book and movie were. The characters from the movie are so entrenched in my brain, I could hear the actors' voices speaking the lines in my head! Beautiful story.